Desinfcktions- und Entw. Fundamentgrube / foundation excavations for the disinfection and disinfestation installation. Fundamentgrube der Entwesungsofenanlage für B.W. 32 als Wassenlichte Wanne / foundation excavation for the disinfestation oven installation for B.W. 32 as a watertight basin. Scale 1:100. drawn by prisoner 538. checked by Dejaco and countersigned by Bischoff on 17/3/43. This drawing, with three cross sections of the disinfestation “ovens” is not presented. It indicates that Entwesungsofen = Entwesungskammer and that the agent used in this installation is dry heat i.e., very hot air. The designation B.W. covers all drainage and sewage work whatever the Bauabschnitt / construction stage at Birkenau. Drawn by prisoners 89711 and 89722 [though probably only the second number is valid. the first being struck through] on 24/5/33. 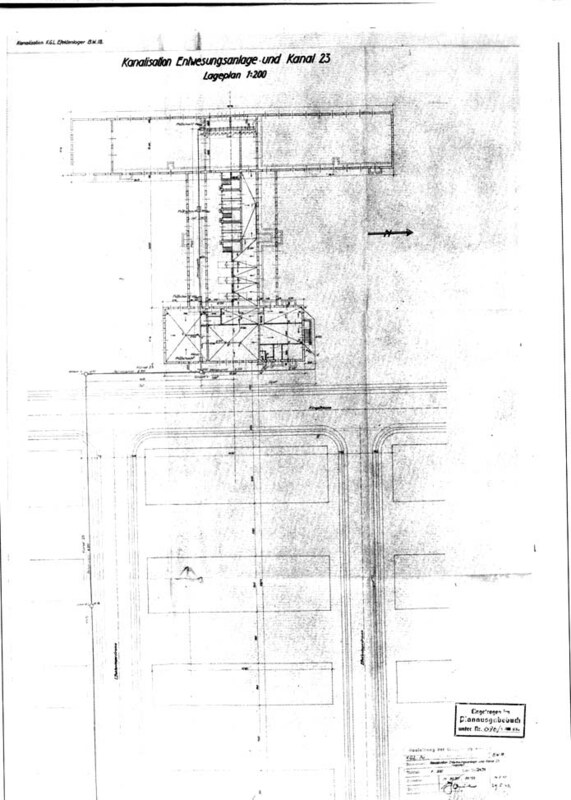 This drawing is an example showing that each building in Birkenau had to have effective drainage (evacuation of waste water and rainwater), a precaution made necessary by the proximity of the water table and the great number of prisoners. This drawing served to establish the names of the roads along which the Hungarian Jews were moving when they were photographed by the SS in May-June 1944 (photos published in “L'Album d'Auschwitz” Seuil. November 1993).